Fair highlight from Ursus Books Ltd.
TINGQUA, (Guan Lianchang). Album of 50 Gouache Paintings on Thick Paper of Treaty Ports, the Opium War, Costumes, Ceremonies, Genre-Paintings, Chinese gardens, and Scenes in and around Canton. The 50 gouache watercolours are painted on thick Western paper stocks of varying manufacture, several with watermarks: "Whatman 1844" and captioned in pencil at lower right margin. Divided 1/3 and 2/3 between vertical and horizontal. Small folio, 315 x 235 mm., interleaved with tissue paper, bound in early twentieth-century English red morocco, intricate gilt-tooled covers and spine, a.e.g., [allegedly by James Burn, bookbinder to Queen Victoria]. Canton, ca 1860. An exceptional album of Chinese export watercolours by the hand of the finest practitioner of the art, Guan Lianchang, known to Westerners by the name "Tingqua." Canton's proximity to Hong Kong meant that it had a special importance for foreign merchants, missionaries, and travelers of all kinds. Tingqua's shop in Canton, located at No. 16 Tongwenjie, employed a large number of assistants in his studio during his most productive years 1840 to 1860. The studio's business consisted primarily in producing watercolours on a narrow variety of subjects, often sold in sets consisting of twelve or twenty-four sheets, and usually drawn or painted on pith paper. These "original" watercolours most frequently represented manufacturing processes (such as tea, lacquer, cotton, or porcelain), Chinese deities and/or rulers, street venders or theater performers, intricate gardens, Chinese junks, and specimens of natural history. Less frequently, one would find views of Guangzhou (Canton), the Pearl River at Huangbu (Whampoa), Macao and Shanghai. However, this album is different. First, it is painted on thick, imported paper from Europe. This paper was expensive, more difficult and less likely to transport to the West as Chinese Export, and rarely was it used by studio members. Only the highest quality of albums, such as the present one painted in refined, virtuosic detail, were executed by Tingqua himself. The watercolours offer a few first-rate examples of traditional Tingqua subject matter. There are three spectacular images of Houqua's garden; Houqua, (Wu Bingjian 1769-1843), the most powerful of the Hong merchants in the Thirteen Factories, was a leader of the Canton Cohong, and a figure known throughout the Far East. There are several outstanding paintings of Canton and the Whampoa anchorage, Hong Kong, Shanghai, Macao, and Amoy. These panoramic city views are of exceptional documentary and aesthetic value. 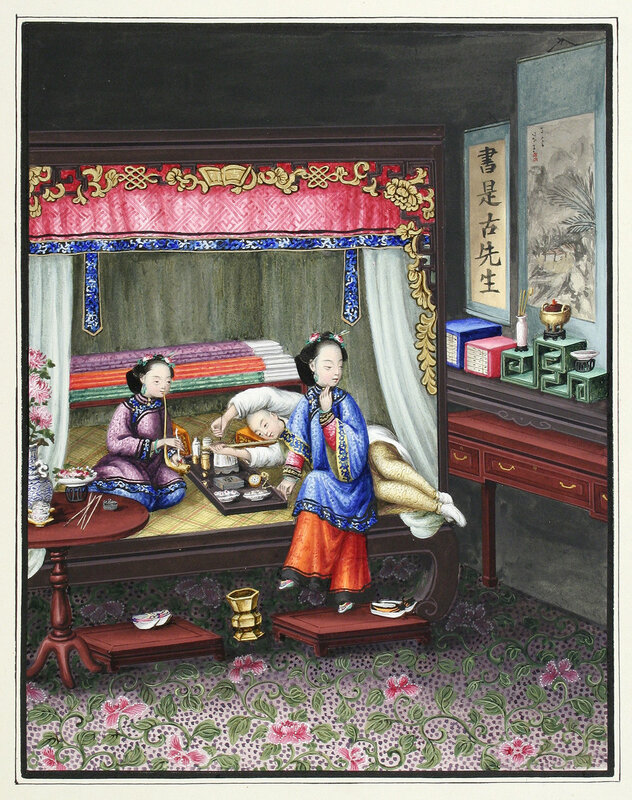 Particularly remarkable are two views relating to the Second Opium War. Tingqua could not have had first-hand experience of this affair and would have relied on foreign accounts or possibly photographs for his renditions. In between are paintings of Chinese junks; fourteen of flowers, fruits and insects; a Chinese marriage and a bridal procession, Chinese theatrical performers, and two portraits of the Chinese Emperor and his wife. Tingqua (Guan Lianchang, 1809-1870) came from a family of painters and artists. His father, Guan Zuolin (fl. 1770-1810, western name, Spoilum), was among the first identifiable artists of the Cantonese export school. His elder brother Lamqua (Guan Qiaochang, 1801-60) specialized in oil paintings, and it is presumed that Tingqua, as the younger brother, restricted himself to gouache and watercolour simply to avoid rivalry. 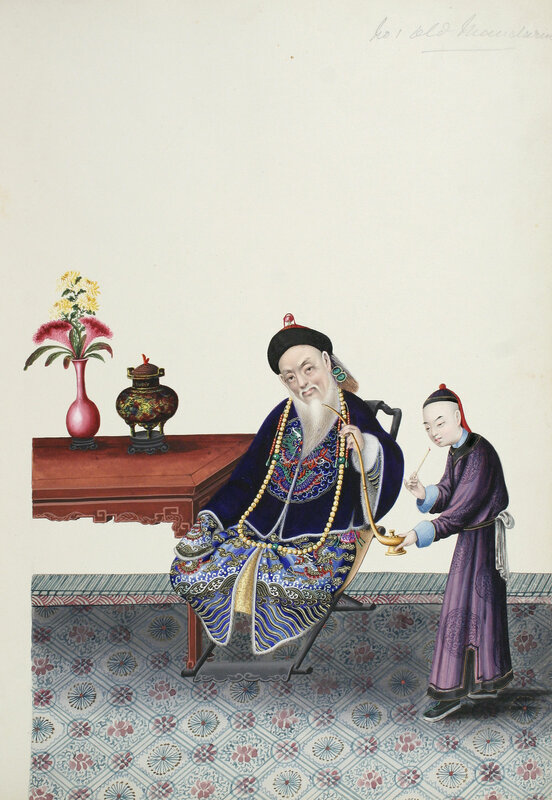 History has honored Tingqua, especially when individual watercolours can be attributed to the hand of the artist himself, as the Chinese painter whose "gorgeous pictures are among the finest and most detailed works of his time." Occasional light fingerstaining and occasional light foxing, but overall in fine, bright condition. PROVENANCE: Alfred Fincham (1810-1862) Englishman who lived in China for fifteen years and died at Hong Kong 1862, album presented in Hong Kong to his wife, Anne Maria in 1861, with presentation inscription. The album was most likely commissioned by Fincham directly from the artist Tingqua. By descent through his family. See: Clunas, Chinese Export Watercolours, pp 81-83. Crossman, The China Trade, pp. 105-114.